A trail of misfortunes destroyed Captain Edward Robert Sterling’s beloved fleet of giant sailing ships. Nicole Cama found this story hidden among the vast holdings of the museum’s Samuel J Hood Studio Collection, which records this family of North American shipowners and their links with Australia. IN THE EARLY 20TH CENTURY, photographer Samuel J Hood was discovering new ways to make his mark in an industry that was only just gaining momentum. His tactic was simple but effective – he would take his trusty Folmer & Schwing Grafex camera to Sydney Harbour to photograph vessels and their crews. Before his later career in photojournalism flourished, he relied on the income from portraits he took of captains and their families. One of the families he photographed was that of Captain Edward Robert Sterling, an American shipowner and sea captain with Australian interests. Over the years, Hood documented their lavish lifestyle, which seems to come alive through his camera lens for viewers almost 100 years later. What these photographs cannot show, however, are the tragic events that were to unfold shortly after the images were taken. This is the story of a family who experienced the high life and had it snatched away, and of a man whose undying passion for the great sailing ships was crushed by fnancial ruin as his beloved feet, one by one, fell victim to merciless seas and the Great Depression. Captain Edward Robert Sterling was born on 3 October in about 1860 in Sheet Harbour in Nova Scotia, Canada. From an early age he was exposed to the sea; growing up in a coastal town, his love for seafaring would have developed as he watched sailing vessels of all types come into port. According to one news report, he ran away from home at the age of nine to begin his career at sea, and by 21 he was a captain. At some point after this and possibly before he migrated to the United States in 1883, he married Helen B Watt (b 1866), also from Nova Scotia, and the daughter of a ship’s captain. Sterling and his wife were based in Seattle, Washington, and had three children: Ray Milton (b 1894), Ethel Manila (b 1895) and Helen Dorothy (b 1896), who was known by her second name. Ray later followed in his father’s footsteps and became captain of the family’s six-masted barquentine E R Sterling. By 1919, Captain E R Sterling was listed as the president and general manager of Sterling Shipping Company in Blaine, Washington. Throughout the 1910s and 20s, Sterling plied the timber trade between America, Australia and New Zealand. He often made the journeys himself as captain, along with his family, and it seems that the Sterlings enjoyed their trips to Australia. Hood’s photographs show the family at the races and happily driving and picnicking around Sydney. On 17 December 1916 Ray married an Australian woman, Ethel May Francis, and within a couple of years their daughter, Margaret Francis, was born. 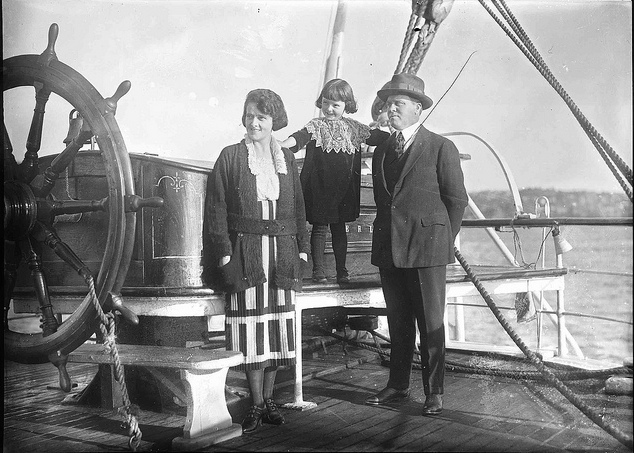 Captain Ray Milton Sterling on the deck of E R Sterling, with his Australian wife Ethel May Sterling and their daughter Margaret Francis Sterling, c 1922. The series of intimate portraits taken on board E R Sterling between 1910 and 1925 are Hood’s best photographs of the family. They depict family and crew seated in the vessel’s state-of-the-art saloon which, according to the Cairns Post, moved beyond ‘cramped quarters’ and ‘hurricane lamps’ to a player piano and a gramophone, which Sterling had concealed in the room’s centre table, an ‘ingenious combination’ of music and dining table. These were clearly golden years for the family, and the portraits of the captain and crew members illustrate their sense of attachment to the ships of the Sterling Line. Little did they know that a crippling series of disasters awaited the feet. 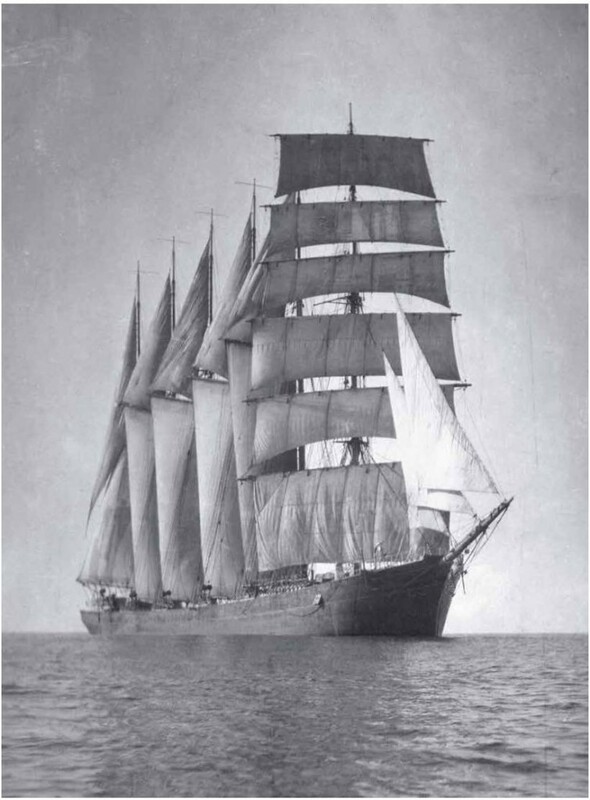 The first occurred in 1922, when on 21 January the Helen B Sterling – a four-masted schooner that cost Sterling £15,000 and which he named after his wife – was partially dismasted by a gale off the Three Kings Islands, north-west of New Zealand, while en route from Newcastle in New South Wales to San Francisco. Captain G R Harris, in command of the ship at the time, ordered a wireless SOS call to be put out which stated, ‘We are waiting for her to go down’. The message was received by the crew of HMAS Melbourne, who set out in search of the stricken vessel. They sent a message in reply, which simply read, ‘We are certain to fnd you. Keep good heart’. At midnight, the crew spotted the sinking schooner with the aid of searchlights and launched a rescue cutter with 16 volunteers. All 18 crew and passengers were rescued and all of the Australian naval men who risked their lives were awarded gold medals by US President Warren G Harding. The vessel and its freight, however, were not only lost, they were uninsured, and according to one news report, Captain Sterling claimed he was left with losses totalling £53,000. The next unfortunate occurrence concerned Sterling’s beloved six-masted barquentine, E R Sterling. On 16 April 1927, the ship left Port Adelaide for London with a cargo of between 40,000 and 50,000 bags of wheat. All was going well until it rounded Cape Horn and encountered icebergs stretching for 500 miles (800 km). After navigating through those, the crew faced a heavy gale north of the Falkland Islands on 4 July and the barquentine was partially dismasted. With only four masts remaining, Captain E R Sterling made the fateful decision to sail on and forgo refuge at the port of Montevideo. After crossing the equator at 4 am on 4 September near the Cape Verde Islands, E R Sterling was hit by a hurricane. Four gruelling hours later, the foremast was lost and Chief Offcer Roderick Mackenzie was fatally injured as he attempted to rescue the rigging. There was no doctor on board and Captain Sterling tended to the wounded man in his quarters. Two hours later, the captain read the committal sentences as the chief officer’s body was sent over the side into his watery grave. SS Norman Monarch eventually answered their SOS calls and offered to tow the vessel into port, but Captain Sterling declined the offer. Instead, he and the crew made their way to Saint Thomas in the US Virgin Islands, in the West Indies. According to the captain’s report, they sailed 2,212 miles (3,560 km) in poor weather and vessel conditions before arriving in port on 15 October. The cargo was transferred to a steamer, then on 15 December E R Sterling began a tow of 4,000 miles (6,430 km) to London, arriving at the Thames in a shambles on 28 January 1928. It had been a horror voyage that took a total of nine months. On 24 March 1928, E R Sterling made its last voyage to Sunderland, where it met its end at the hands of shipbreakers. Adding to the family’s misfortunes, in May 1926, Sterling had purchased the fourmasted schooner Hawaii, renaming it Ethel M Sterling after his daughter. After it sailed to San Francisco in September 1927, only months after E R Sterling had commenced its fateful voyage, Sterling Shipping Co was forced to sell the schooner because they were unable to pay for the two 240-horsepower diesel engines they had installed shortly after it was acquired. Crew members aboard Helen B Sterling, possibly the six-masted schooner. The next event in this tale of woe befell the sister ships that Captain Sterling senior had named after his daughter and wife: the six-masted wooden schooners Dorothy H Sterling and Helen B Sterling (the second ship of this name). Both were built in Portland, Oregon, around 1920 and were originally named Oregon Pine and Oregon Fir respectively. It was reported that Oregon Pine was one of the largest sailing vessels then built, at a cost of £50,000. After a series of unsuccessful voyages, E R Sterling purchased the vessel and changed its name to Dorothy H Sterling in 1928. Again, his ownership was short lived. In 1929, the vessel arrived in Port Adelaide carrying a load of timber from America. Sterling Shipping Co found that they could not pay the harbour dues and crew wages. Consequently, the crew was forced to abandon ship. The vessel was auctioned for a mere £50 to the Harbors Board, which then recouped part of the ship’s debts by selling it to shipbreakers. 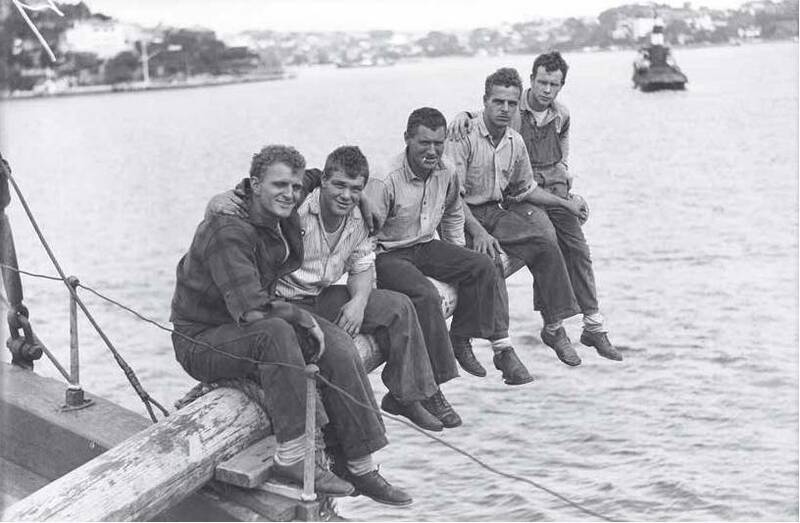 In 1932, after selling everything of value, the shipbreakers planned to tow the hull to the Adelaide suburb of Ethelton to be torn apart by the unemployed for firewood. The hull would not fit through Jervois Bridge, however, and it was towed to the North Arm of the Port Adelaide River to be abandoned in the Garden Island Ships’ Graveyard, where the skeleton of its hull remains to this day, a relic of the past. In March 1934, after it was dismantled and stripped of anything of value, Helen B Sterling, as it was still affectionately known, was set on fire in 20 places in its ‘last resting place’, aptly known as Kerosene Bay (now Balls Head Bay near Waverton). 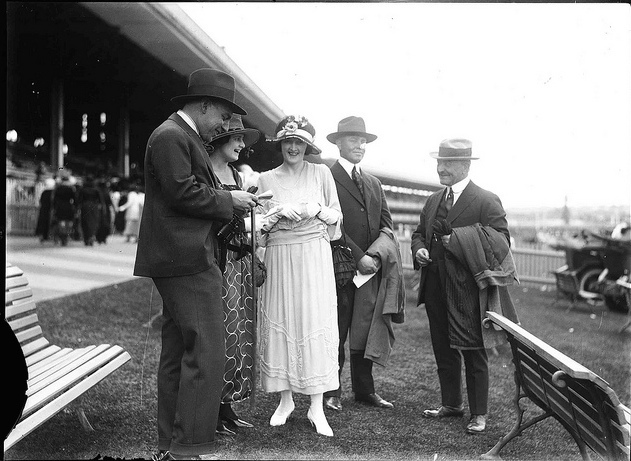 A day at the races: (right to left) Captain Edward Robert Sterling, his son Ray Milton Sterling and Australian daughter-in-law Ethel May Sterling, with unidentified friends, c 1918. Little information is currently available about what happened between this period and E R Sterling’s death, possibly in 1943. An article after the E R Sterling disaster states that he had had a ‘long and adventurous seafaring life’ and ‘seemed little the worse for his experiences’ (The Argus, 24 March 1928). Another report in The Mail on the same date described him in one word – ‘heartbroken’. Journalists’ impressions aside, Captain Sterling was a traditionalist. He could not, in his own words, ‘abide steam’, he revelled in the ‘beauty and mystery of the ships, and the magic of the sea’ and he had a profound pride in his vessels and crew. Based on this and the fact that he named all but one of his vessels after the women he loved most in his life, it seems likely that these misfortunes would have had an adverse effect on him. Captain Sterling was first and foremost a ‘real sailor’, second a shipowner. He had an affnity with the sea and a love affair with the sailing ship that endured all his life. He was of a certain school that bitterly rejected the development of steam-powered vessels as banal and stubbornly stood by his feet of sailing vessels, with devastating consequences. In the end, Sterling was a man torn between his love for the tall sailing ship and the stark economic reality caused by his unwillingness to embrace the modern age. Sterling’s feet of schooners and barquentines comprised some of the largest timber sailing vessels ever built, in a belated attempt to keep sail economically competitive in an age of iron and steam. Their design had distinct pros and cons. They were built to carry enormous bulk cargoes such as lumber, with reduced operating costs thanks to relatively small crews. However, they were vulnerable to harsh weather and were often in port, idle for months on end, waiting to source sufficient cargo to fill their enormous holds. E R Sterling was the largest barquentine in the world and the key to its design lay in the gaff sails it carried on all of its many masts, except the foremast. They could be raised, reefed or furled from the deck with the aid of a donkey engine for halyards, enabling ‘10 men to achieve what it would ordinarily take 24 men to do on a square rigger’, as the Cairns Post reported (1 February 1922). Yet although it sailed with some success, E R Sterling lay without charter for months in Adelaide before the 1927 voyage that led to its demise. Similarly, Dorothy H Sterling wasted away in port for months before it was finally sent to Port Adelaide and ripped apart. The small number of crew coupled with these vessels’ size proved a dangerous combination when they encountered bad weather. Despite their majesty, the ships of the Sterling Line have passed into maritime folklore. 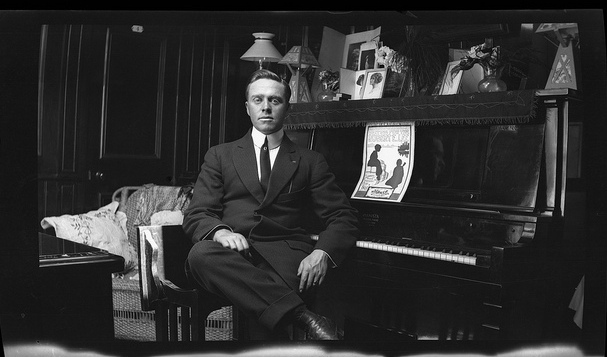 Captain E R Sterling’s son, Ray Milton Sterling, seated next to a symbol of modern invention, the player piano. The saloon of E R Sterling was reported as most beautiful, equipped with a range of contemporary gadgets built for ‘comfort and convenience’. The sad fate of the Sterling Line contrasts with Hood’s photographs of happier days, before industrial change and economic hardship took their toll. Amid the heartbreak, Hood’s images hint at stories that may otherwise have been left untold. Discoveries like these not only underline the significance of the Hood collection to Australia’s maritime history, they reinforce the nature of his photographs. They show a time when ships’ portraits were popular among crew members, before steam superseded sail and the demand for Hood’s portraiture declined. Moreover, they display the human face of sailing that Hood so rigorously pursued. They depict the crew’s camaraderie and the close relationship they shared with their vessels. Apart from Hood’s photographs and a few objects from the collection, all that remains for us to see today are the barest bones of the Dorothy H Sterling, which appear at low tide in the Port River in Adelaide – destroyed after shipbreakers had ‘wrenched all her beauty from her’, and abandoned to ‘that graveyard of broken ships where the waves lap sadly and the wind sighs mournfully through the timbers of what were once graceful craft’ (The Advertiser, 5 February 1932). The bones of Dorothy H Sterling are remnants of a bygone era; they are mementos of the boy who fell in love with sailing and ran away to sea. With thanks to Steve Reynolds of The Marine Life Society of South Australia and his work on the Sterling ships, in particular ‘The Schooner Dorothy H Sterling (and other ships associated with her)’, MLSSA Newsletter No 355, June 2008. NOTE: This story was originally published in Signals magazine, Issue 102, Mar-May 2013, pp 13-17. Reproduced courtesy of the Australian National Maritime Museum.